I've been absent on this blog for what seems like ages. I was hoping to get back to blogging after the busy summer. I'm not even trying to talk about things like regular blogging, because let's be honest, my blogging frequency is not very high and it's certainly rather irregular. However my work schedule didn't allow me to spend time working on my personal projects. Or maybe it's just an excuse. Anyway, I have a very good reason to be back today. I'm very excited to participate in a little surprise baby shower for Emiko who is expecting a baby girl soon! I met Emiko in person last year at FBC, shortly before she moved from Italy to Australia. She is such a sweet person and I wish we could be with her celebrating this exciting time of her life. Although the distance makes is quite complicated to get together, no distance can stop food blogger friends from sharing their love through food and blogs. Since we all live in different places, we decided to organise a virtual baby shower. 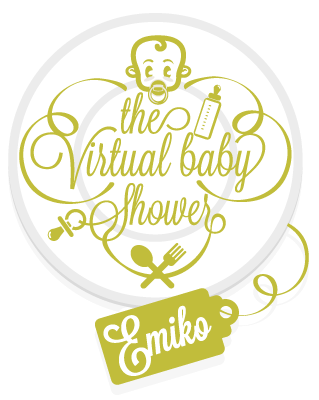 Together we have created a baby shower menu to celebrate Emiko's soon-to-arrive bundle of joy. These mini tartlets are for you Emiko, I hope you would like them. I wish you and your husband joy and happiness in your life with your precious baby girl! Melt the butter in pan add the leeks and garlic and sweat gently, stirring often, for 5 minutes until soft. Remove from the heat, stir in the parsley and nutmeg. Set aside. Melt the butter in a small saucepan. Lay one sheet of filo pastry on a flat surface, brush lightly with the melted butter and cut into 9 squares (10x10cm). Lay three squares of pastry on top of each other, turning each square so they don't line up and create a star shape. Press into a buttered muffin tin. Repeat with another sheet of filo pastry to make 12 cases. In a bowl, beat the eggs with creme fraiche, season with salt and pepper. Divide the egg mixture among the cases. 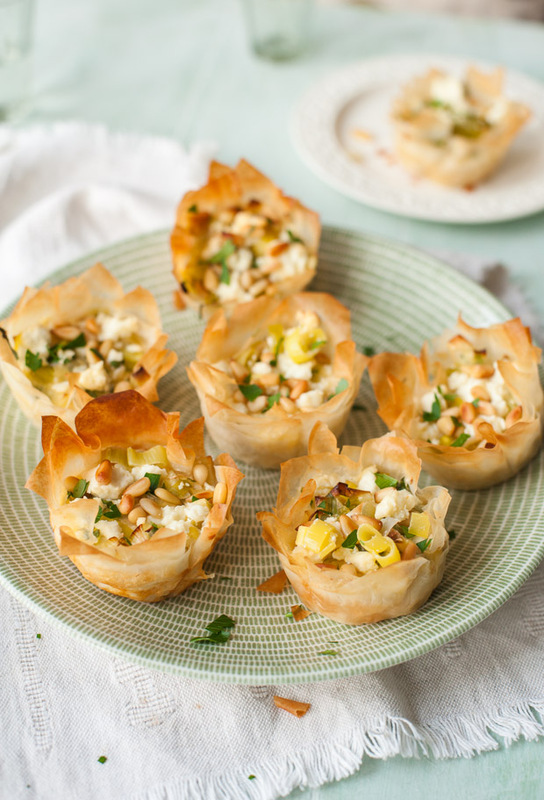 Spoon the leeks on top and scatter with crumbled feta cheese and pine nuts. Bake for 15 - 20 minutes until the filling is set and the filo pastry is lightly golden. 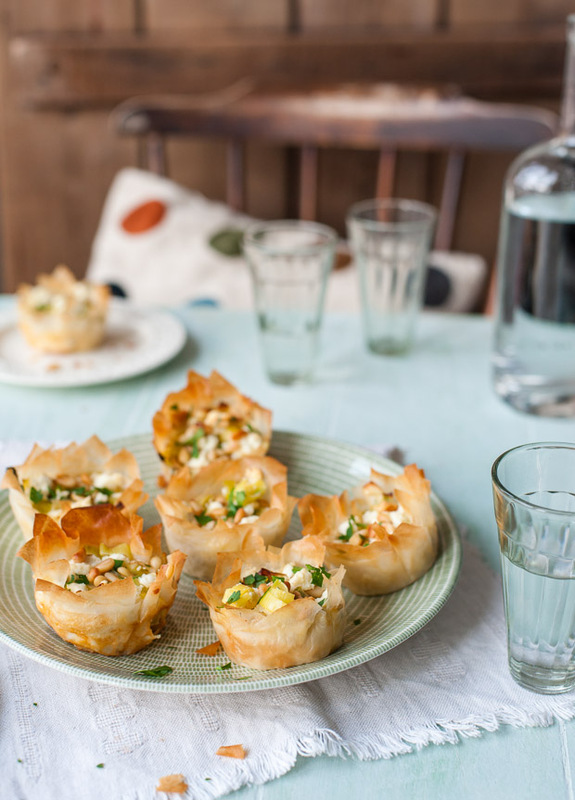 Let cool slightly, remove from the muffin tin and serve.